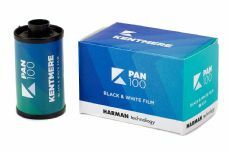 Made by Ilford, this small range of film (now branded Kentmere Pan 100 and 400) was originally made for US market in order to give Ilford a "budget" alternative to some of the re-packaged and re-branded Kodak and Fuji films being offered. However they ultimately released it in the UK, also as a competitive alternative to the Ilford range. This top quality film is available in 35mm only and in 100 or 400 ASA/ISO. Ideal for photographers looking for a cheaper and more basic alternative to FP4 or HP5 and other conventional grain films.